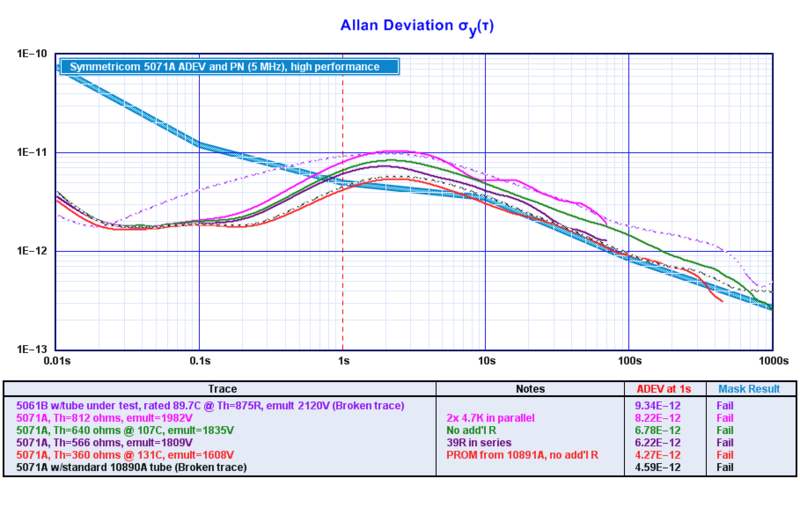 The graphs below compare the short-term Allan deviation obtained from an HP 5071A cesium-beam frequency standard after modifications described by Corby Dawson (.pdf here). Thanks to Corby's work, HP 5071A standards that require new cesium-beam tubes are able to use the more readily-available HP 5061A-era tubes. 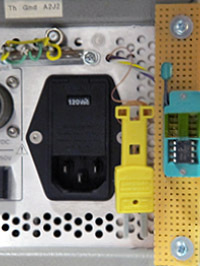 In order to evaluate the resulting performance differences, this particular unit was modified to permit access to its thermistor and thermocouple elements, as well as to the 24LC16B EEPROM used by the HP 5071A to optimize its operating parameters to match the installed cesium-beam tube. These adaptations are visible at right. This particular HP 5061-6077 tube is known to be in near-mint condition, with a measured figure of merit of 9 (Vp=2.5V, Vv=0.34V, Vb=0.24V). It was capable of meeting the 5071A's short-term performance specifications when installed in its original 5061B standard, in fact. As the graphs show, the tube works even better in the 5071A, meeting the standard-performance test mask limits with room to spare. 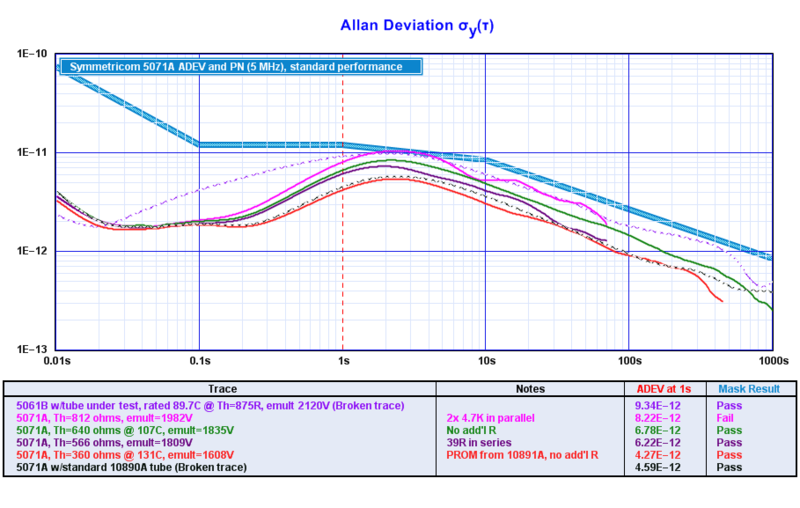 The results suggest that part of the 5071A's outstanding short-term stability performance appears to be due to running the tube at a lower EM voltage than was typical in the 5061-era standards, and raising the oven temperature to compensate. Overall, however, the transplanted 5061-6077 tube doesn't perform quite as well as a typical 10890A tube, probably because the EEPROM from the 10890A doesn't match the 5061-6077 tube's operating parameters. To match the 10890A's performance with the 5061-6077, it was necessary to use an EEPROM from a 10891A tube, running the cesium oven well over its rated temperature.